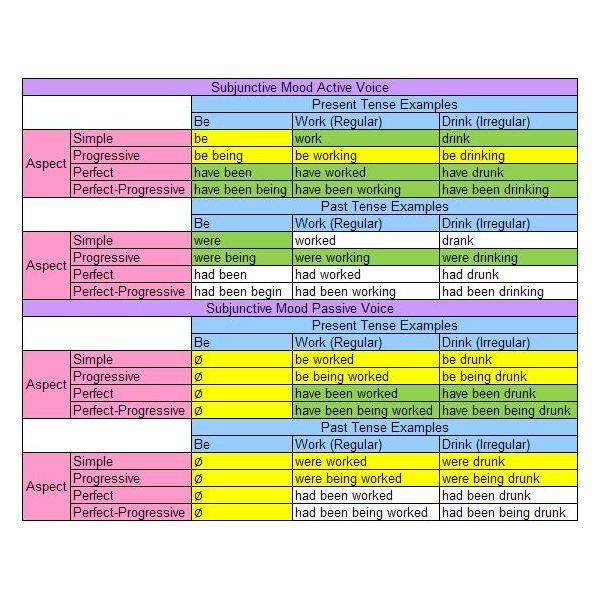 The following chart provides examples of the subjunctive mood for the verb be, regular verbs, and irregular verbs. Note that the verbs highlighted in yellow differ completely from the indicative forms, the verbs highlighted in green differ only from the indicative forms in the third person singular, and the verbs not highlighted are identical to the indicative forms. The verb be and similar intransitive verbs do not have subjunctive passive forms. Unlike the indicative mood, the subjunctive mood often appears in subordinate clauses. Also known as dependent clauses, subordinate clauses contain both a subject and a predicate but cannot function as complete sentences. Many of the verb phrases in the subjunctive mood in the previous examples begin with the subordinating conjunction if. Noun clauses that begin with if are often referred to as if clauses. The subjunctive mood in English most frequently appears in if clauses because such clauses always express possibility, necessity, and contingency. For example, in the sentence If the driveway were being resealed, then I would park on the road, my parking on the road is contingent upon the driveway being resealed. However, not all dependent clauses that express possibility, necessity, and contingency begin with the subordinating conjunction if. For example, the boy not failing the test was contingent on his studying as expressed in the sentence Had the boy been studying as he said, he would not have failed the test. The noun clause Had the boy been studying as he said is a subordinate clause that contains the subjunctive mood. This noun clause could also be written as If the boy had been studying as he said with an if introducing the clause. However, in English, the if of the if clause can be removed so long as the first auxiliary verb switches places with the subject. Therefore, the if clause If the driveway were being resealed could also be written as Were the driveway being resealed without eliminating the subjunctive mood. The subjunctive mood also appears in a verb phrase following a modal verb. The conjugated verb phrase following a modal verb is also always in a present subjunctive form. In the first example, Beyoncé uses the subjunctive mood of the verb be in the if clause If I were a boy. The use of the subjunctive in the clause If I were a boy expresses contingency; if Beyoncé were male instead of female, she would do the things she lists. However, she is not male, so she uses the subjunctive to express an idea that is contrary to fact at the time of the statement. In the second example, however, Gwen Stefani uses the indicative form of the verb be in place of the subjunctive form in two if clauses: If I was a rich girl and if I was a wealthy girl. She is still expressing uncertain modality (she would only have all the money in the world in the event that she were rich) but uses a form of the verb that is identical to the indicative. Many native English speakers similarly use indicative forms to express the subjunctive mood. For example, a speaker who says His parents insist that he eats all of his vegetables before his dessert is expressing subjunctivity but is using the indicative form of the verb (eats) rather than the subjunctive form (eat). The decline of the subjunctive in English is even more apparent and inevitable considering that about half of the subjunctive forms are already identical to the indicative forms. The subjunctive had been working is indistinguishable in form from the indicative had been working. In fact, the use of subjunctive forms is only required in the most formal registers of English usage. Language change is inevitable, and all distinct subjunctive forms may soon disappear from the English language.